Toy and Game Warehouse has been providing best-selling toys and games to the market for more than 60 years. Our experience enables us to bring our customers leading brands!!! Based on the work of artist Jason Freeny. 26 fully detachable organ and body parts. Balloon dog is transparent to show internal organs and skeletal structure. Includes assembly guide. Ages 8 and up. 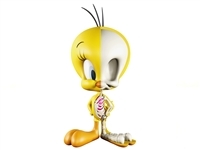 You don't see a puddy tat, but you can see Tweety Bird like never before! The Tweety XXRAY 4-Inch Deluxe Vinyl Figure features a cross-section of the beloved cartoon character. This simple and elegant chess set is made with glass. Etched squares create the checkerboard pattern. Frosted and clear glass chess pieces. Board size: 14" x 14" King size: 3"
This deluxe chess set has an inlaid, wood chessboard that folds and closes with a latch to house all the chess pieces. 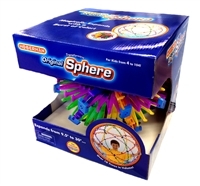 Board size: 15" x 15" (open) King size: 3"
The Original Hoberman Sphere Rainbow is an award winning toy great for all ages. An expanding sphere of color that you can throw, bounce, kick, spin, roll and suspend. It even expands from 9.5" to 30". Unique and eye-catching, these spheres inspire children to be creative and inventive. As seen on Michael Scott's desk in The Office (US). American version in sturdy Pink aluminum attaché. Case holds 168 non-fading tiles. 4 translucent racks, dice and instructions. Turn your walls into a racecar speedway! Hours of creative play with countless track configurations! The object of the Hoberman Brain Twist Puzzle is, like the Rubik's Cube, to get matching colors on every side. In order to solve it, you move the colors around by twisting the corners in this mechanical puzzle. But here’s the twist, the whole shape flips inside-out and you’re not done until both sides are complete! Ages 8 and up. 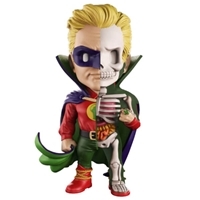 See what really is underneath the mask with this Green Lantern Golden Age XXRAY 4-Inch Vinyl Figure! XXRAY by Jason Freeny is proud to present Wave 5 (DC Comics), Reverse Flash from the DC Universe! 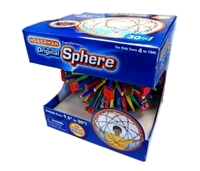 The Mini Hoberman Sphere is an award winning toy that's great for all ages. A sphere of multiple colors that you can throw, bounce, kick, spin, roll and suspend. It even expands from 5.5" to 12". 16 fully detachable organ and body parts. Model by Jason Freeny is transparent to show internal organs and structure. 5" Tall. Ages 8 and up. 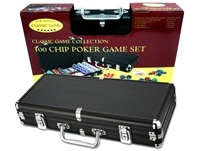 This revolving poker chip rack comes with 300 plastic chips in five assorted colors. A retractable handle allows for easy travel and two playing card wells are great for keeping your game set together. 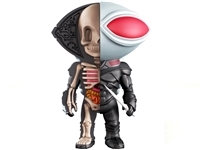 XXRAY is proud to present Wave 3 (DC Comics), Black Manta from the DC Universe! 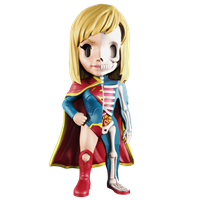 This supervillian stands at 10cm (4") tall, featuring an unique dissection. This collectible is individually hand painted and assembled. Collect all specimens and form the ultimate collection! Set of 300 Casino-style and weight(11.5 grams) poker chips. Comes in a cool black aluminum case so you can enjoy them anywhere you and your friends want to play. Construction Zone™ Scoop it up and haul it away! Little boys have enjoyed playing with front loaders and dump trucks for decades. Who says you can’t play any more? Relive those good ‘ol days with this executive desktop construction set – perfect for the kid in all of us. 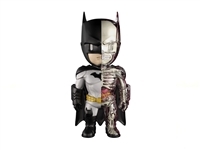 See what really is underneath the mask with this Batman anatomy model! Large screen for easy viewing. Includes 7 games: Draw, 2's Wild, Bonus Poker, Double Bonus Poker, Double Double Bonus Poker, Jokers Wild and Double Jokers Wild. Uses 2 "AAA" Batteries (included). Item dimensions: 6" X 4 1/4" X 3/4". Ages 8 and up. 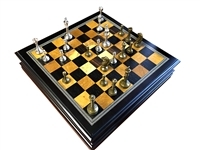 This stylish chess set features metal Staunton chess pieces in gold and silver colors with an inlaid wood board. The board also functions as a storage for the chess pieces along with a velour pouch to protect the pieces. 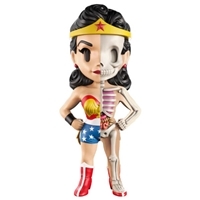 See what really is underneath the mask with this Wonder Woman Golden Age XXRAY 4-Inch Vinyl Figure!